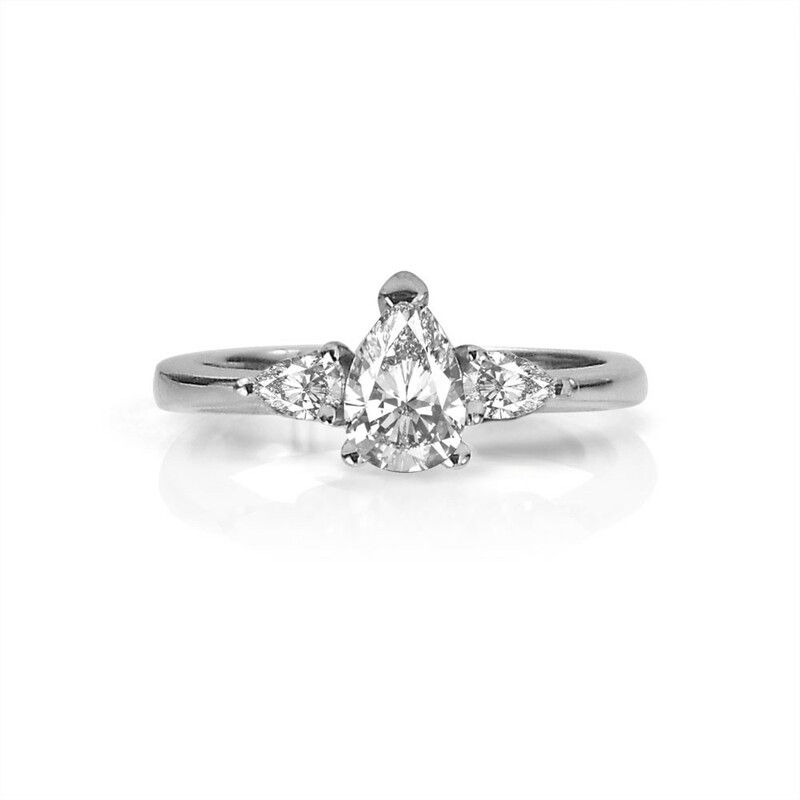 This three-stone diamond engagement ring features a pear-shaped Canadian diamond flanked by two smaller pear-shaped diamond accents, all set in white gold. The use of pear-shaped diamonds gives the ring a vintage feel and also creates a sense of balanced asymmetry and movement that is different than traditional three-stone diamond engagement rings made with round diamonds. Three-stone engagement rings have a lovely sentiment behind them, usually standing for one of two things. The first is past, present and future - the idea that the life is a journey and that you're in it for the long haul. The second idea that three-stone engagement rings express is the idea of you, me and us - the concept that when two people combine their lives, they create a new entity that is to be celebrated alongside the two people who enter into it. There are also some who believe that the three stones symbolize love, friendship and fidelity, all of which are important to a successful romantic relationship. This engagement ring was one of Kyla's "Studio1098 Staff Picks". Kyla says: "This is my favourite engagement ring. 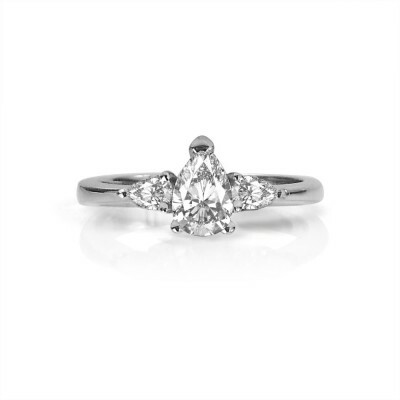 The pear shape takes a traditional three-stone ring and gives it an edgy twist. It has a vintage vibe and looks very elegant on the hand." Balance is one of the most important things to get right for any engagement ring design. The three pear-shaped diamonds in this three-stone diamond engagement ring complement each other, creating harmony, energy and balance. Whether the centre stone is oval, round, pear or some other shape, and whether it is a diamond, sapphire or some other gemstone, that asymmetrical balance is one of the reasons that we really enjoy using pear-shaped diamonds as accent stones in any three-stone diamond engagement ring.